X-Caliber Tactical is an authorized reseller and distributor of FoxFury products. Please include your address with your order so that we can establish a total including shipping and insurance to your location. We accept payments by way of personal check, money orders (all checks must clear prior to orders being shipped), or we take Visa, Master Card or Discover Card over the phone. 470 nm LED Scene Light and Spotlight for Forensic / CSI lab and field use. Use with orange goggles to search for blood, GSR and more. Set of two Nomad wall clamps for use with the Nomad Prime and or 360 area lights. Mounts to any flat surface via #10 bolts (not included). Can also be mounted inside or outside of vehicle to use the Nomads as a vehicle mounted light. Blinding 12,000 lumen CREE LED vehicle and security searchlight with innovative and disorienting turbo-strobe. Varying strobe frequency that forces most people to play nice and is an effective and non-lethal form of crowd control / compliance. Designed for by law enforcement and security personnel and can be mounted to trucks, urban assault vehicles, a wall/tower along with government, SWAT and off-road vehicles. Provides lighting up to 2.0 miles (3.2 km) away. Housed in aircraft-grade aluminum and is all weather resistant. Extremely powerful 11,000 lumen white LED spotlight / search light with focused 8° beam. Fully submersible to 24 feet / 7 meters. Instantly turns on to full power with minimal projected heat and no warm up or cool down required. Made of aircraft-grade aluminum and is impact resistant. Designed for use with Aircraft Rescue, Bomb Squad / EOD, Homeland Security and/or can be mounted to a Fire Truck. Extremely Powerful 18 degree LED Spot / Search light. Fully Submersible to 24 feet / 7 meters. Instantly turns on to Full Power. Minimal projected heat and no warm up or cool down is required. Designed for use with Aircraft Rescue, Bomb Squad / EOD, Homeland Security and/or can be mounted to a Fire Truck. The very first LED flashlight to break 1,000 lumen barrier. Our most powerful aluminum LED flashlights with a non-roll head. Forensic (Blue to IR) models available. LED color, intensity battery type and life vary by model. Powered by a Li-ion rechargeable battery system. Up to 1,130 torch lumen. Our top selling ultra-slim 10 LED headlamps that offer focused and panoramic lighting. Elastic and silicone straps are available. Powered by 4 AAs. Up to 40 torch lumen. Our top selling ultra-slim LED headlamps that offer focused and panoramic lighting. Elastic and silicone straps are available. Forensic (UV to IR), scuba, stealth and fire resistant models available. LED number, color, strap type, intensity, modes and battery life vary by model. Powered by 4 AAs or a rechargeable battery pack. Up to 60 torch lumen. Powerful compact metal LED light. Helmet light and shield light models available. Intensity, modes, battery type and life vary by model. Powered by 4 AA batteries. Up to 120 torch lumens. Wide angle LED headlamps that offer focused and panoramic lighting. Elastic and silicone straps are available. Intrinsically safe (explosion proof) and fire resistant models available. LED color, strap type, intensity, modes and battery life vary by model. Powered by 4 AA batteries. Up to 68 torch lumens. Our most powerful LED headlamp. Fire resistant, bike and riot shield models available. Intensity, modes, battery type and life vary by model. Powered by 4 C or 6 CR123 batteries. Up to 520 torch lumen. Our original extra-wide angle LED headlamps that offer focused and panoramic lighting. Elastic and silicone straps are available. Intrinsically safe (explosion proof) and fire resistant models available. LED color, strap type, intensity, modes and battery life vary by model. Powered by 4 AA batteries. 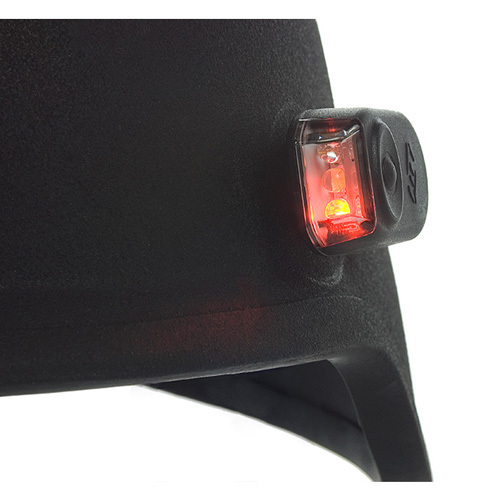 Side helmet mounted LED light for EMS, SAR, Pilots, Medics, Military and Special Operations. Breakaway design prevents user from becoming entangled, reducing risk of injury. Attaches to the side screw of the ACH (Army and Marines), MICH (Army and Marines) and PASGT (Air Force) helmets. Can also attach to most helmets (including flight helmets and hard hats) via industrial velcro. Powerful long throw, smoke cutting LED right angle lights with SMO-KUT technology. Performs the job of two lights (conventional right angle light and box light). Intensity and battery life vary by model. Up to 600 torch lumen. Ultra-durable LED right angle lights with multiple wear options (belt, pocket, etc.). Forensic (UV to IR) and phosphorescent models available. LED color, intensity and battery life vary by model. Powered by 3 AA batteries. Up to 28 torch lumen. Waterproof LED pistol light to 60 ft. Features a sealed mud resistant and ambidextrous design. Has no moving or operational parts. Fits most full size duty pistols and tactical rifles with a picatinny rail. Laser and non-laser models available. Powered by 1 CR123 battery. Up to 140 torch lumen. Powerful LED riot and entry shield lights. Aftermarket (retrofittable) models attach via industrial Velcro. OEM models for shield manufacturers also available. Powered by 6 CR123 batteries. Up to 900 torch lumen. High visibility lightweight wrist, strap or belt light. Used to identify individuals or a team in a stadium or in remote and high density traffic areas. Alternates two colors (varies by model) based on movement or automatically. 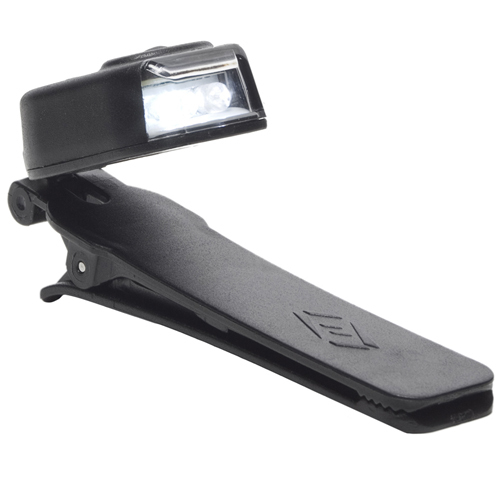 Clip Light for Up Close work. Quick Tilt capability and multiple modes enables light placement and intensities to be adjusted. Attaches to pocket, clipboard, hat and many other surfaces. Designed for Industrial, Fire, Medical Professionals as well as for Recreational Use. Meets NFPA Fire Resistant Requirements--500°F (260°C) for 30 minutes. We carry an extensive selection of accessories for FoxFury products. CAll or email us for more details.